It doesn’t matter whether you have a bass boat, pontoon boat, or speed boat – at various times during the boating season you are going to load and unload your watercraft from your trailer. And the bigger and heavier your boat is, the more effort it requires to raise and lower it. 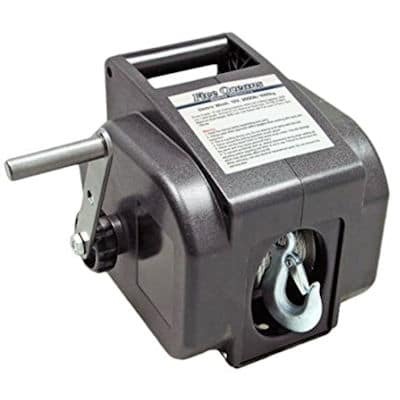 And while a hand-crank winch may work fine for lighter crafts, an electric trailer winch makes it a lot easier to load boats, personal watercraft, vehicles, and other cargo onto a trailer. There are a number of different electric marine winch models on the market, and each has its own strengths, weaknesses, and unique features. That is why we’ve reviewed three of the top electric boat winches on the market – to help you find the right winch at a great price. Keep reading to see what makes these great electric boat trailer winches rise above their competitors. 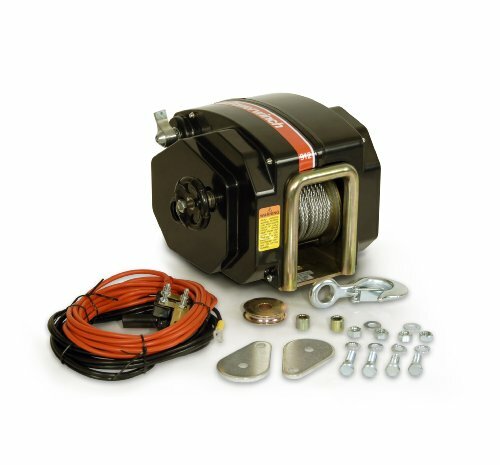 Our top choice as best 12-Volt electric boat trailer winch has to be the Dutton-Lainson TW9000. Dutton-Lainson is a US-based company (Nebraska, specifically) that has been in operation since 1886, and their name is synonymous with quality. The TW9000 is a strong little unit, offering 3000 pounds of pulling strength to drag your boat out of the water. According to the device’s rating that is strong enough to handle up to a 9000 pound boat! And at 10′ per minute it does so at a quick pace. The TW9000 features a 20′ polyester strap with an attached hook for connecting to your boat, both a power out and free spooling operation to extend the strap. It also comes with a wiring harness to connect it to your electrical system, and an emergency crank on the outside chance there is a problem with electric operation. The online reviews for the Dutton-Lainson TW9000 are overwhelmingly positive, with almost 90% of the reviewers giving it 4 or 5 stars. 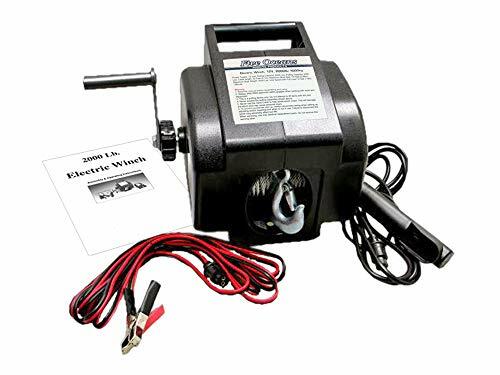 Phrases like “worked flawlessly”, “worth all the cost”, “quality workmanship”, and “works great” are common accolades of this great 12-volt electric winch. The only downside in our eyes is the lack of a remote control for the TW9000. The controls for operating the winch are located on the top of the unit, and are easy to use. But if a remote control is one of your must-have features you might want to consider another winch in our round-up. But despite that one shortcoming, we still feel the TW9000 is a great 12-volt electric boat trailer winch at a great price. 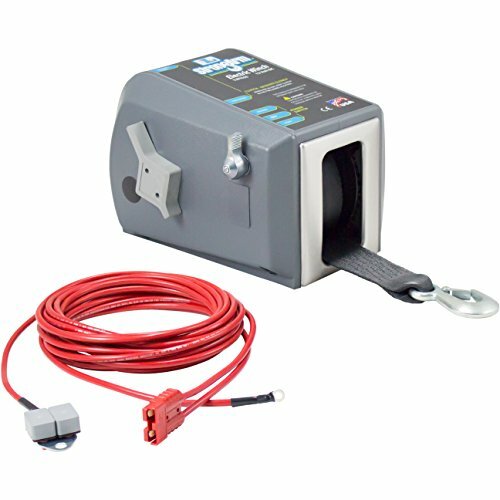 Our #2 choice of electric winches for boat trailers is the Powerwinch 912. While Powerwinch hasn’t been in operation for as long as Dutton-Lainson, they still have over 50 years of experience under their belt, and are known in the industry for putting out quality products. And the Powerwinch 912 carries on that fine tradition, delivering a whopping 4000 pounds of lifting power, allowing you to haul in a boat as heavy as 11,500 pounds. And it comes with a pulley block that attaches to your boat’s bow that will effectively double the winch’s load capacity. The 912 comes with 40 feet of steel cable, giving you plenty of length to hook your boat, and a freewheel out capability so that you can quickly extend the line. And once you start drawing in your boat the Powerwinch does it at a nice 8-foot-per-minute clip. A review of comments online from people that have purchased the Powerwinch 912 shows a significant number leaving 4-star and 5-star ratings. Most laud the strength of the 912, with several also mentioning the unit’s consistency. Overall, the Powerwinch 912 is a powerful and well-built electric boat trailer winch. Like the Dutton-Lainson TW9000 the 912 does not come with a remote control, which may be an issue for some users. But the quality construction, impressive pulling power, and competitive price make the 912 worthy of consideration if you are in the market for a trailer winch. The third entry in our collection of 12-volt electric boat trailer winches is the Five Oceans Electric Marine Trailer Recovery Winch. This winch is definitely lighter duty than our #1 and #2 choices, but it still offers a respectable number of features, and does so at a price that is easy on your wallet. The Five Oceans winch offers 2000 pounds of pulling power, which allows you to haul in a boat that weighs up to 5000 pounds. That is less than the two previous units, but still enough to pull in an 18 foot boat. It is also a little slower – pulling in at 6 feet per minute. But that is a small price to pay in exchange for letting an electric motor do all the work. The unit has a free spooling option to make for quick hookup, and comes with a handy corded remote switch – something missing from our top two choices. And the unit adds a manual emergency crank handle, just in case. Five Oceans has a good reputation online, and 80% of the reviews were either 4-star or 5-star. The most common phrase in those reviews is “does the job well”, which is really what you are looking for in an electric boat winch. And one of the best features is the low price of the Five Oceans winch. 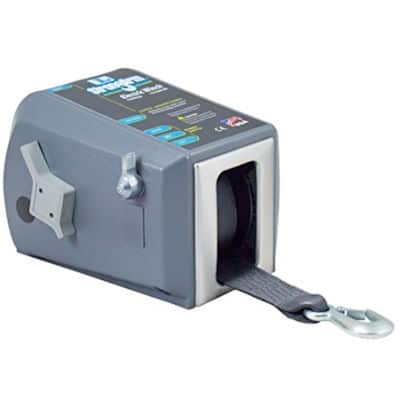 If you are looking for a winch for a smaller boat this item is hard to pass up. What Size Winch? – The winch power you’ll need will depend on the size, length, and weight of your boat. Look at the max load rating and/or the maximum boat length for the trailer winch to find the right one for your boat. Wireless Remote or Wired? 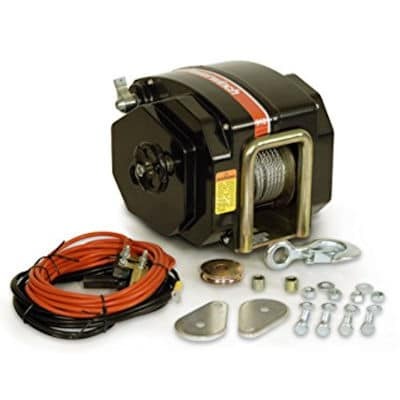 – Electric trailer winches come with wireless or corded remote controls. Either way, you’ll have to keep track of the remote. A wireless remote lets you load the boat from further away, and there are no cords to trip over or get in the way. Winch Strap or Cable? – Both straps and cables are durable and efficient when handled properly. A trailer winch with a nylon strap is easier on your hands, since there are no stray wires that can slice into your skin and it won’t get pinched between layers on the drum. Steel cable, on the other hand, is better able to withstand rugged conditions and won’t rot when exposed to rain and harsh weather. Since a winch strap is thicker and takes up more space on the drum than a cable, you’ll want to go with cable if you need a longer reach with the hook. Connect the trailer winch to the power source. Connect the remote control (if using a corded remote). Line up the trailer and boat to get ready for loading. Release the clutch on the electric winch so that you can freespool the cable out. Attach the winch hook to the bow eye on your boat. Engage the clutch to set the brake. Be careful not to over tighten the clutch. Get clear of the cable, electric winch, and boat. Make sure all bystanders are out of harm’s way in case anything should go wrong. Power in the cable until the boat is fully loaded and the boat juts up against the bow stop. Disconnect the remote control (if using a corded remote). Secure the boat to the trailer. If not already connected, attach the winch hook to the bow eye on your boat. Connect the electric winch to the power source. Plug in the remote control (if corded). 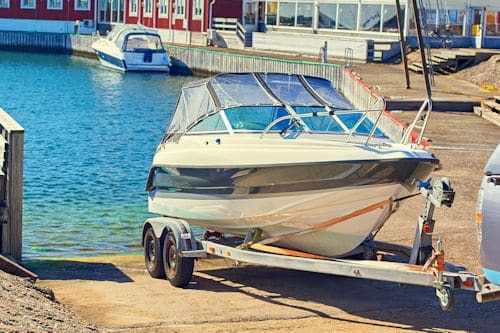 Remove the boat tie downs and the chains that secure the boat and trailer, leaving only the winch hook connected to the bow eye. Disengage the clutch so that the cable is allowed to freespool. Let the boat slide off the trailer into the water. If the boat slides down too fast, you can tighten the clutch slightly to slow down the boat. After the boat is in the water, release the winch hook from the bow eye. Engage the clutch so that the brake is set. Keeping a steady amount of tension on the winch cable, power in the cable with the winch remote. Be careful not to let your fingers get too close to the winch. Secure the winch hook to prevent accidental damage. Unplug the remote control and store it in a safe, dry location.